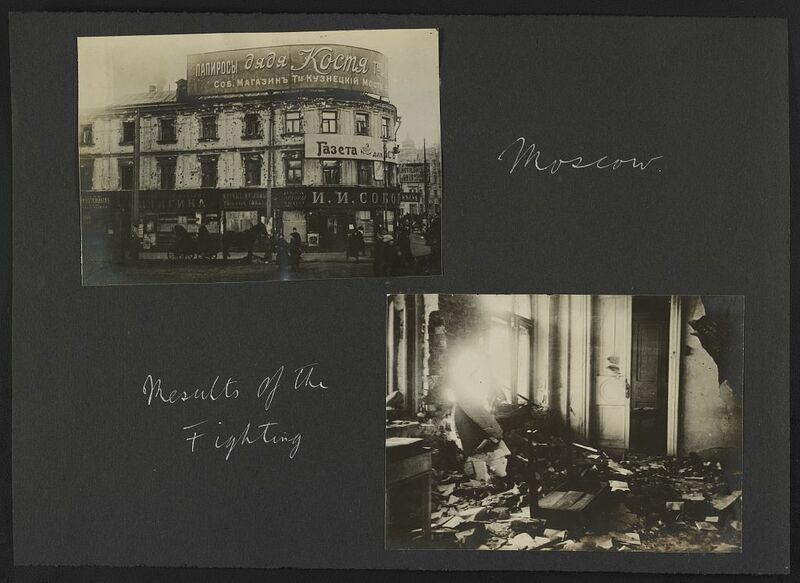 Arriving in Petrograd in the days just after the October Revolution, when Bolshevik forces overthrew the Russian Provisional Government, the photo album Pringle compiled is peppered with the effects of the conflict. 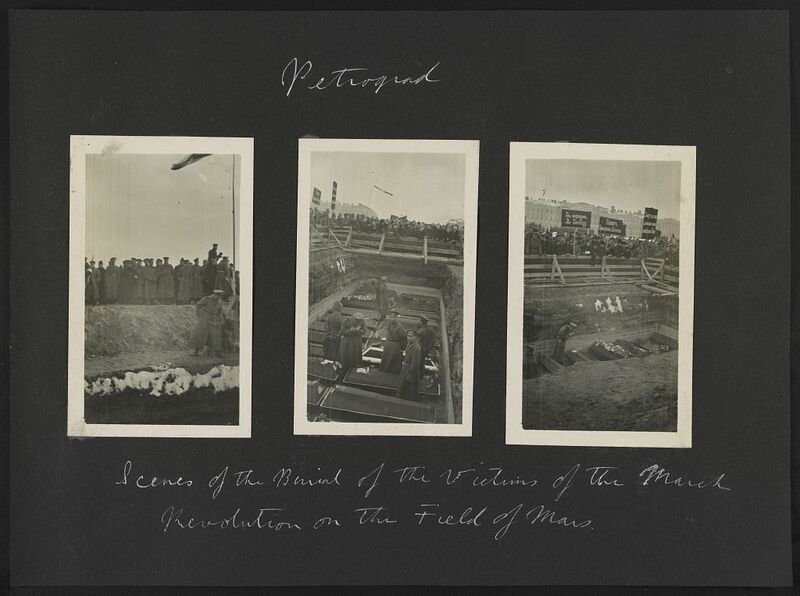 His photographs in Moscow, Petrograd, and other Russian cities show bullet-riddled buildings, prisoners, parades and marches, ceremonies to memorialize those killed and everyday Russians living amidst the turmoil. 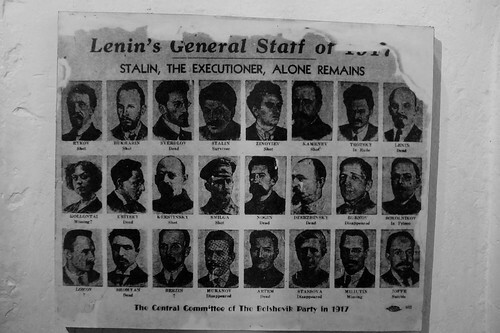 This photo album was a recent gift to the Prints and Photographs Division by Pringle’s nephew, Robert M. Pringle, and offers a unique outsider’s perspective on the internal conflict that eventually reshaped Russia into the Soviet Union. The photos document his travels through Russia and into Asia over the course of many months as he made his way back to the U.S. with a group of travel companions. Pringle’s album joins the Library’s strong collections of personal photo albums and extensive research resources on the history of Russia and the Soviet Union. A selection of images from the album has been digitized and the full album can be viewed by appointment in the Prints and Photographs Reading Room. Read an overview of the Russian Collections at the Library of Congress and browse other digital presentations on Russia. On February 1, 1960, four young men sat down at the Woolworth’s lunch counter in Greensboro, North Carolina, and ordered coffee and doughnuts. More than fifty years later, this may not seem like a daring act, but it was. First the waitress and then the store manager explained that the lunch counter was reserved for white people and that they could not serve the four freshmen from the nearby Agricultural & Technical College, because they were African American. The four men– Ezell Blair, Jr., Franklin McCain, David Richmond, and Joseph McNeil–refused to leave, and the next day fellow students joined the sit-in. As news of the protest spread, African Americans sat down at segregated lunch counters elsewhere in the South, and picketers demonstrated in front of Woolworth stores in New York City, even though segregation was not practiced at their lunch counters. Photographs of the sit-ins distributed by the news wire services convey the resolve of the students, the hostile reaction they endured, as well as the impact on lunch counter business. 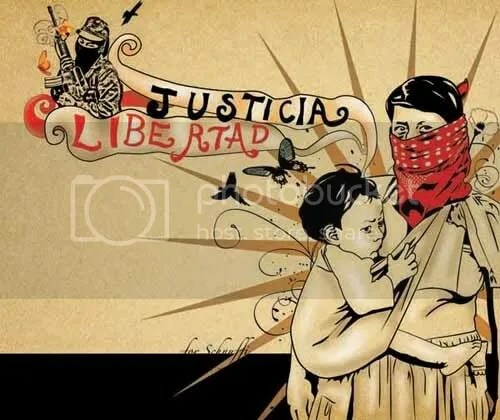 The images helped raise awareness of racial injustice and growing resistance to it. Today they offer a continuing reminder of the many individual acts of courage that made up the Civil Rights movement. As we begin African American History Month, we hope that the pictures and many other resources of the Library of Congress offer an opportunity to learn and to reflect. View additional images relating to the quest for African American civil rights that display large images outside Library of Congress buildings. View a summary of Prints & Photographs Division resources for the study of African American history, with search tips. 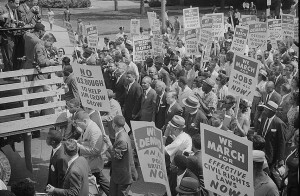 View the African American History Month portal, highlighting resources at the Library of Congress and other institutions. Learn more about the Greensboro lunch counter sit-in: If you have a chance to visit Washington, D.C., the National Museum of American History has the original lunch counter and offers a performance, where visitors experience what it was like to sit-in at the lunch counter. My children and I attended and found it very powerful. You can also see the performance on YouTube.